In the Overview tab my README.md can be displayed. Unfortunately I have no preview of this, so this might take me several commits to get it right. It would be great if you offered a preview, so that I can write my readme directly in the browser, or at least paste it there to see it. For the issue tracker you already provide such a preview (albeit it is not previewing Markdown, but another format). I have great news to share! One of the developers on the team has found some spare time to tackle this feature request over the past few weeks. Earlier this week, the changes were released meaning that you can now preview your markdown files before committing them! I'm going to resolve this issue. If you had requests that weren't addressed as part of this change, I ask that you please raise a new ticket instead of commenting on this issue so that we can keep track of them separately. Thanks for being a continued user of Bitbucket, and happy editing! I suggest trying Hashify. It provides a pretty decent preview. Yes, Hashify looks very good. Also http://rst.ninjs.org/ is a nice online editor for reStructuredText. Maybe one of them or both can be used on BB. Most of the code is already written, only the Look&Feel needs to be adopted to fit into the site. Thanks for the link, André. We're certainly hoping to make improvements in this area, but we're busy working on other features just at the moment. I just wanted to second this request for some means to preview our markdown, I would particularly love to see it for marking up comments/code Bitbucket style (i.e. https://confluence.atlassian.com/display/BITBUCKET/Marking+up+Comments), which is something generic markdown previewers don't support. Yep, I +1 this. It would be great to see. Being able to preview bitbucket's specific syntax-highlighting would be handy. +1 Hello, dear dev team! :] I know and understand, that you're treating BitBucket like an orphan child (because it is free for most users) and you're focusing all your powers on JIRA. But... did you noticed, that within two days we will celebrate second birthday since this issue was risen? Yes, two years has passed and you did nothing to a feature request, that most of us takes as crucial and fundamental. No matter, if you like this or not, we really need a live preview for all the Markdown edits! Using external tools may solve basic Markdown display, but when using specific feature like syntax highlighting, it's another story. And of course, using this becomes worse when you take documents from Github and bring it here, it just doesn't work (```lang vs :::lang). Hi all, we currently offer preview functionality for markdown on all comments, pull request and issue descriptions, and wikis. Just to clarify, what is being asked for here is specifically a preview for the README (or, presumably, other markdown files) when editing source online with Bitbucket? That is what I understand and would like to have. To be able to edit a MD file and have a preview button before commit it. Issue #8947 was marked as a duplicate of this issue. Yes exactly Zach, when I want to edit a .rst or .md file online, I would love to see a preview before I saw my changes. Because otherwise I will end up with 8 unnecessary commits, cause my readme/docs don’t get displayed as I hoped for. It seems trivial to add this feature, as BitBucket already is able to render such files, and there already are certain preview capabilities implemented. Would be very nice if you could add this. +1 this is a very helpful feature to have a preview on markdown files. I support the cause too. The problem is annoying for everyone who has notifications turned on. Even worse, what works fine in hashify or dillinger fails in the bitbucket README.md file. So I have a README which is poorly formatted, because your formatting is not consistent with standard online tools, and you have no preview of your own. ..or if we can't have a preview feature, it'd be nice if Bitbucket renders *.md files exactly like Hashify, for example, so we could at least see what we're doing there instead. +1 why is this feature available when editing md files on wiki page.. and not when editing those files in src repo ? This feature would be much appreciated - we are working on a project which uses markdown as its source files at the moment, and the wiki mode on bitbucket is nice! At least fix markdown preview so it works as should according to specification. HTML comments should stay comments, shouldn't be escaped1!!!!!! +1 and I need some kind of general online markdown editor like https://stackedit.io/editor to check README.md changes on my computer. +1 especially since Bitbucket has different parsing rules then some of the mentioned preview pages. For instance, I did not know Bitbucket required 4 spaces of indentation for sublists. Also, while a live preview would be preferred, a confirmation page with the preview on it would work too. Happy 4th birthday! I'd say I'm late to the party but not as late as this feature. +1 It would be great to have this implemented. I don't know why exactly, but I have one repo which has a link that allows me to edit the README.md and has a button that shows me the preview of the file. I have several other repos with a README.md that does NOT allow me to edit the README.md. 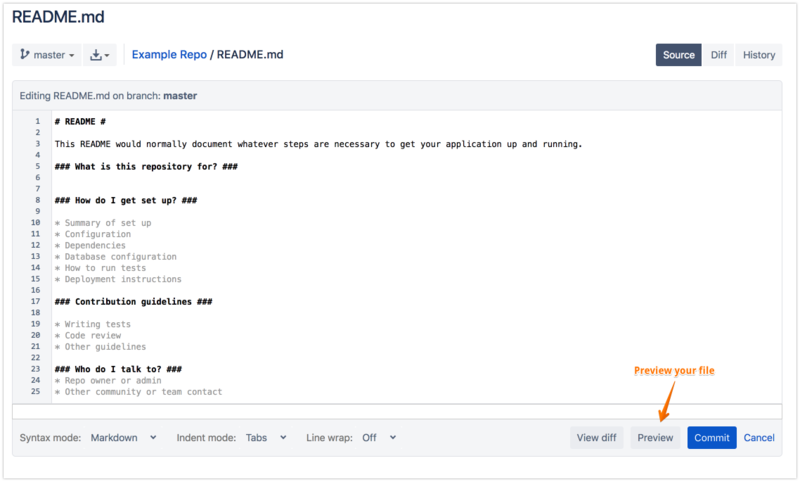 I don't know what the difference is other than when I created the new repo, I created the README.md from the bitbucket webpage, whereas the others probably already existed in an imported git repo. +1 I just had this issue yesterday of not being able to preview the .md file. What made it worse was that I used an external editor to view what I was doing and then I realized that bitbucket was not rendering the code block syntax correctly (while other markdown editors were) If I had a preview I would have adjusted to the lack of syntax support. +1 for this issue. we should be able to preview the readme! Just came here, see it's been 5 years already. It seems impossible to find an online tool that matches bitbucket syntax exactly so there is always this suspense when you edit your files. Is it good ? How many ridiculous commits will be necessary ? I just created a private dummy repo to test my md file... So weird. Just saw a preview of the markdown file on bitbucket cloud version. Dunno if others are seeing it too? Yep, I see it too. Great! Georges or anyone, where exactly do you see the preview? Wiktor Tomczak, in Bitbucket on the "Overview" section of a repo there is the display of your standard Readme.md that gets shown. Right there on the page there is a link "Edit README" if you click on that you will get a md editor and preview. Oddly enough if you browse the source code and edit the README.md file from there, then there is no preview. So it seems like Bitbucket has this capability to preview markdown but it is on one place. To Atlassian team, it's nonsense like this that make me favor GitHub over BitBucket. I think the ability to preview the repository readme file has been there for a long time, but .md files in a repository can't be previewed (even though they can also be edited via the web interface). It has already been said quite a few times, but this would be really useful. Happy 5th birthday issue #3491! Existing markdown doesn't work with existing tools like Atom or Macdown. +1. There is diff between hashify and bitbucket's implementation. This feature is very important for editing markdowns online. Bitbucket's markdown parser can't correctly parse the markdown syntax. Please support this feature. It's been 5 years. The preview of markdown parser from Bitbucket should be provided. Would be nice to have the preview option for README.md because it wrongly renders markdown. +1. Waiting for correct MD renderer. Live preview also is very useful feature. Also MD editor looks broken: there is no preview button now. This is killing me :) I need a preview in order to edit effectively and not add commits to my edit cycle. If I use another markdown previewer tool, Bitbucket does not render it (in some cases, even remotely) like the preview tool does. If bitbucket adds it's own flavors it needs it's ow previewer. README's are a luxury to me now: for times when I have nothing other than mucking with markdown edit cycles to do. Just tried to update a README.md. Went to Bitbucket, thinking I'd be able to see the Markdown with a WYSIWYG. Hit the Edit button, and got straight text. No big deal - continued to edit, finished. Options at that point are Commit or Diff - no Preview. Thought maybe the Commit button would provide a preview before I finalized it, but no luck. Did a quick Diff to see what I changed. Hit the back button - WRONG. Dropped me back to the original file view. Needed to hit Cancel instead (even though it's not a dialog box). All changes lost. I have a partial solution for the Bitbucket markup. I researched the engine and extensions they use (python-markdown). I found a utility that uses python markdown that starts a local web server, and lets you edit your Markdown and see the results. After adding support for the extensions that Bitbucket uses, it seems to map identically (although I Atlassian extensions would not be available). The tool looks pretty reasonable. It's pretty disappointing that I need to start up a local web server, copy existing markdown from bitbucket, edit it in the local web server, copy the corrected version of the markdown, and paste it back into bitbucket. It's amazing to me that such basic functionality is not available, especially since I was able to obtain the desired function from open source projects. FYI... There are other online markdown editors available. However, the solution above maps the output very closely to what Bitbucket produces. There are so many markdown variations, that it's hard to find a solution that maps well. There are lots of good online Markdown viewers. However, elements like the table are different in Bitbucket. I need a preview converting my dashes and pipes just like Bitbucket would display them. Please provide a working preview rendering! We need a preview button before commit. I've just had to do several trivial commits correcting typos and omissions that could have been easily handled in a series of Edit-Preview cycles. Since Bitbucket seems to have no idea how to render an MD list that Github renders without issue, it is vital that we have a previewer to troubleshoot similar issues. Having 15 "edited readme" commits on a production branch makes us all look foolish. This issue is 5 years old. We should start a Kickstarter campaign, collect 2K AUD, pay Atlassian for the feature. It would take 6 months but we'd get there 10 times faster. 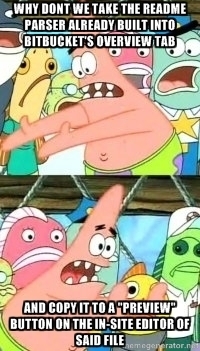 Sounds like a solid plan? Does Atlassian even monitor this issue? Should we just open another one? Better late than never? +1 for this feature in 2018. Thanks for your feedback on this ticket and continued interest in Bitbucket. We review our highest voted issues regularly. improving design and user experience. While we don't have the ability to preview markdown files, we do have syntax highlighting in the Bitbucket editor to assist you with making changes to your file. And as suggested above, you can also use online tools like Hashify to preview your markdown in the meantime. Please continue to follow this ticket - we'll review this request again in a couple month's time and keep you updated on the status via this issue. So basically Atlassian is going full 'Steve Ballmer' by totally ignoring the most requested features and doing whatever the hell they think is good for the users that suffer from the missing features / bugs. Just by resolving the first most voted 20 issues, you resolve the biggest issues that are reported. You will say: 'We cannot resolve all issues .. ", well yes - but having issues with 2000+ votes from 5 years is just ... sorry but excuses will only get you so far. Well I've been following this ticket for quite some time now, with 0 progress. Just say won't do and be clear about your position. Keeping us hanging for 5 years is doing nothing more than wasting time. Using online tools to preview changes is not a good solution, since BitBucket seems to have implemented Markdown differently from everyone else. So something that looks okay on Hashify often look different when rendered by BitBucket. Cannot agree more with Zlatin and Filip. It is crazy that online tools are rendering table written in markdown just fine, however in bitbucket it's messed up. That's the main reason I am following this thread. Why raise multiple unnecessary PRs just to see it's broken? Exactly. Bitbucket markdown works differently. Comments have a working preview. It should be a matter of a day at most to add a preview in markdown files online, too. I'd suggest you add a time estimation for the issues and work on the highest "vote to work" ratio. The top priority stuff mentioned is a joke, I'm sorry. You'll never be finished improving user experience. Code search is either a simple multi file text search or a mammoth project, depending on how you implement it. Improving any experience is a user experience issue. Pipelines are not a core feature, markdown files are. Depending on what you wanna do there, it's easy to take months. One day delay isn't much of a difference, is it? So how about closing a FIVE YEARS OLD issue and move on with your super priority months work? @Aneita Yang thanks for the update. Regarding UX you mentioned. Do you know that your syntax highlight does not match the rendered Markdown? So, syntax highlight is not helpful here unfortunately. Btw, loving pipelines and the progress. Keep it up! @Aneita Yang it's great that we finally have official acknowledgement of this thread. Seeing that it's still active FIVE YEARS after it was first raised should indicate that this is a much desired feature by users of Bitbucket. If I could edit a Readme on my dev machine, as I do source code, and commit to Bitbucket without any distortion I could live without the preview. However, as noted by Stephen Sykes in 2015, the markdown from Bitbucket does not exactly translate to tools such as Hashify and so we require the preview to verify before commit. I believe, just like Katha Glück, that this feature request would consume relatively minimal dev resources to implement. I understand your frustration with this issue; however, while this specific request is highly voted, there are other issues which have gained more traction and accumulated higher interest over a shorter period of time. If you look through the top 10 highest voted tickets on Bitbucket, you will also see that 4 are being actively worked on as part of improving the pull request experience. The Bitbucket team's mission is to enable teams to ship higher quality code, faster. With this mission in mind, we believe that introducing code search, and working on improving the pull request experience and Bitbucket Pipelines, are the right things to be doing. And while we can never be finished with improving user experience, it is something that we continually iterate on to ensure that Bitbucket remains a tool that is simple and intuitive to use. I assure you that the Bitbucket team do take all feature requests seriously. This is just not something that we will be working on in the near future given our other priorities. Aneita, whom should I speak to in order to influence BitBucket decisions? Over the last few years the UX of Bitbucket was ... flaky. Your UI is highly intuitive, well thought out, planned ahead. But you have tremendous amount of bugs and minor UX weirdness. Like, Markdown syntax highlight does not match the rendered Markdown. Or inability to scroll on some pages until I click it. Or asking me to refresh the page while I'm typing at, - I'm refreshing and loosing everything I typed. Who is prioritizing features over customer experience? Can I please talk to them? PS: That bad UX is the only reason why I prefer GitHub over BitBucket. Thanks for the feedback. I've passed your feedback on to our design team for them to consider. If you'd like to discuss these points in more detail, please feel free to reach out to me at ayang@atlassian.com and we can schedule a time to chat. Would it be possible for Atlassian to release the Markdown -> HTML parsing code that you’re using to the community? That would at least allow any of us (or the creators of various markdown editors) to duplicate your transformations and have some idea of what our files will look like when they’re displayed on Bitbucket before we commit changes to our repos. On average, it takes 3-4 commits to get the markdown syntax to work right in Bitbucket. Even a standalone tool on the main Bitbucket window that allowed a user to enter markdown and see what it would look like would be helpful. Then we could copy the markdown into the appropriate file and save it. This seems like it would take less than a week to develop & test and it would make people MUCH happier with your product. Usability is so important and currently BitBucket's markdown is frustating and at times almost unusable. @Aneita Yang This is awesome!! Thank you very much to you and the dev team. @Aneita Yang Yang Thanks to the team and my most sincere gratitude to that hero! @Aneita Yang : when will this feature be released for Bitbucket Server? As mentioned in our documentation, you can preview your markdown files in Bitbucket Server by pressing Command-Shift-P. Please note that this issue tracker tracks known issues and feature requests for Bitbucket Cloud only. If you are interested in the tracked issues for Bitbucket Server, you can look at the issue tracker for Bitbucket Server instead. This is great. I've also requested a markdown preview for editing markdown files in snippets.